I've managed to see a few quite nice butterflies at Penclacwydd this summer. I found a male Small Blue on the reserve (SS534981) on the 27th May, which I think might be quite unusual for the area. Although, there are large patches of Kidney Vetch along the coastal path at Machynys, so maybe it wasn't too far from home. 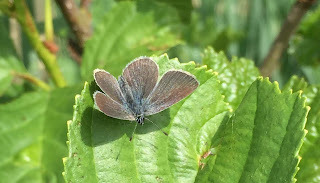 A White-letter Hairstreak feeding in the meadow in between the visitor centre and the Heron's Wing Hide (SS 53250 98323) on the 12th July was a new species for me. One was later photographed in the same location on the 1st August by a visitor. There's almost certainly some sort of breeding population on the site, with such an abundance of healthy Elm's. I also had a Clouded Yellow on a butterfly survey on the 19th July, as well as the usual 17 or so species (SS535981).